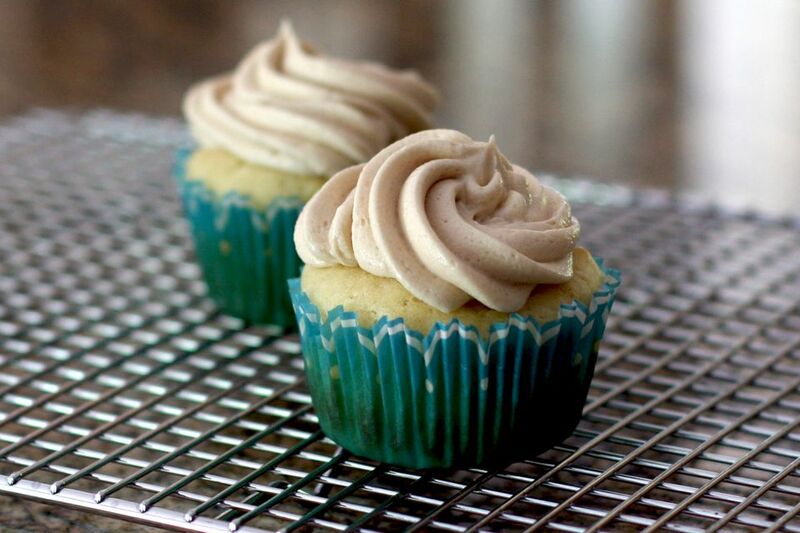 These pancake batter cupcakes are far less sweet than most cupcakes, and the sweet maple frosting makes them a perfect combination. Top with a piece of Maple Brown Sugar Bacon or a little cinnamon sugar. The darkest grade of maple syrup will be the most flavorful. Maple flakes are made with pure maple syrup. If you have some, sprinkle some over the frosting. If you like these, try your hand at other Autumnal cupcakes like Carrot Cupcakes With Vanilla Cream Cheese Frosting, Pumpkin Cupcakes, or Butter Pecan Cupcakes With Brown Sugar Frosting. If using cupcake papers, spray lightly with nonstick cooking spray. Line a 12-cup muffin tin with the prepared cupcake papers. Or, grease and flour the cups or spray with baking spray. In a bowl combine the flour, baking powder, baking soda, salt, and sugar. In a large bowl, whisk the buttermilk with the eggs and melted cooled butter until smooth. Whisk in the flavoring(s). Stir in the flour mixture until smooth. Spoon into the prepared pan, filling cups or papers about 2/3 full. Bake for 16 to 18 minutes, or until lightly browned. Cool in pan on a rack for 10 minutes, then remove the cupcakes to a rack to cool completely. In a mixing bowl with electric mixer, beat the butter with 1 cup of confectioners' sugar until smooth and light. Add the maple syrup and 2 more cups of confectioners' sugar, along with 2 tablespoons of cream, and the maple and vanilla extracts. Beat until light and fluffy, adding more confectioners' sugar or cream, as needed.